WASHINGTON (Reuters) - The United States on Wednesday charged two Russian intelligence agents and two criminal hackers with masterminding the 2014 theft of 500 million Yahoo accounts, marking the first time the U.S. government has criminally charged Russian spies for cyber offenses. "The criminal conduct at issue, carried out and otherwise facilitated by officers from an FSB unit that serves as the FBI’s point of contact in Moscow on cyber crime matters, is beyond the pale,” Acting Assistant Attorney General Mary McCord said at a press conference announcing the charges. Yahoo said when it announced the then-unprecedented breach last September that it believed the attack was state-sponsored, and on Wednesday the company said the indictment "unequivocally shows" that to be the case. 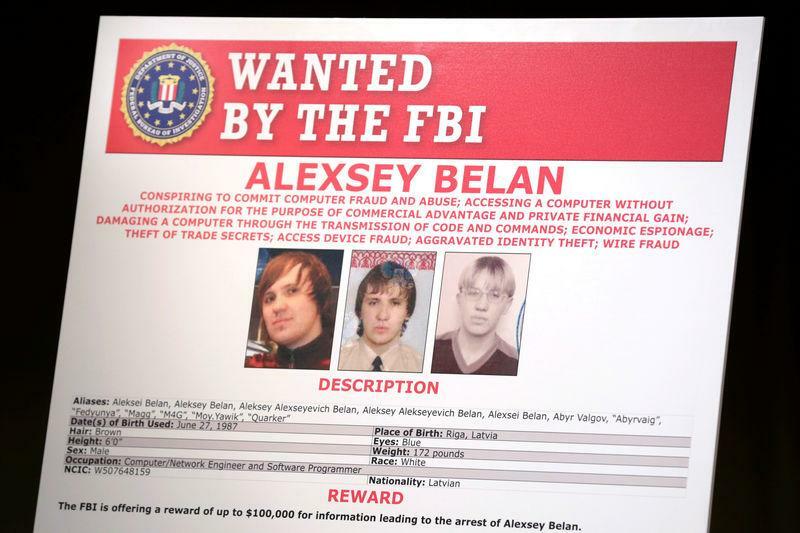 The alleged criminals involved in the scheme include Alexsey Belan, who is among the FBI's most-wanted cyber criminals and was arrested in Europe in June 2013 but escaped to Russia before he could be extradited to the United States, according to the Justice Department. Washington has not contacted Moscow over the charges, Russian news agencies reported on Wednesday, citing a "highly placed" source in Moscow. In a statement, White House spokesman Michael Anton said the charges "are part of a broad effort across the government to defend the United States against cyber attacks and cyber-related crimes." Yahoo in December announced another breach that occurred in 2013 affecting one billion accounts. Special Agent Jack Bennett of the FBI's San Francisco Division said the 2013 breach is unrelated and that an investigation of that incident is ongoing. The hacks forced Yahoo to accept a discount of $350 million in what had been a $4.83 billion deal to sell its main assets to Verizon Communications Inc.
Interpol issued a "red notice" on Belan in relation to an earlier hacking campaign, according to the indictment. Instead of arresting Belan, however, the FSB recruited him to help with cyber espionage and provided tools to evade detection from other authorities. Belan later gained unauthorized access to Yahoo's network that he shared with FSB, the indictment said.